One of the rules of thumb I learned in the early days of my consulting career was that your project wasn’t real until you had at least one napkin or placemat filed in your working papers with some sketch that captured the essence of what you were designing or trying to understand. Dan Roam’s new book, The Back of the Napkin, makes the same case and provides substantial insight and guidance on how to make those sketches more useful. While a good picture may indeed be worth a 1000 words, Roam is no advocate of simply letting a picture speak for itself. He has two purposes with his book. The first is to equip you with better tools for using simple pictures to furthering your own understanding of problems. The second is to educate and convince you to put those tools to use in helping communicate your new understanding to others. Roam provides good advice about the kinds of pictures you should draw to address the classic journalistic questions (Who, What, Where, When, Why, How, and How Much). He also introduces a curious mnemonic, SQVID, which translates to Simple, Quality, Vision, Individual Attributes, and Delta. Each represents one pole in choices you can make when you are sketching a particular concept. This is a rich and useful book. 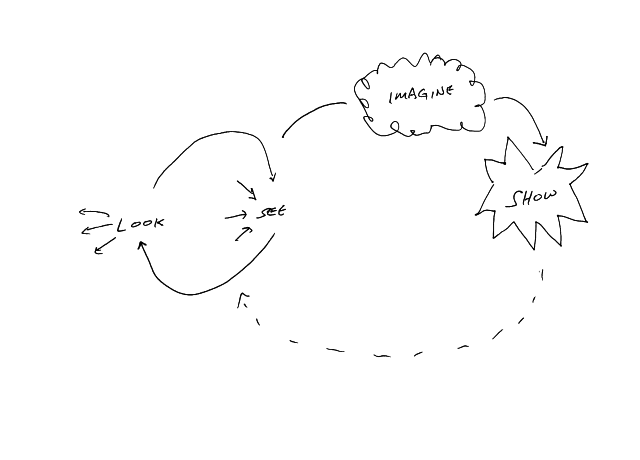 If you’re already a visual thinker, it offers a good organizing framework and collection of tools and techniques to add to your bag of tricks. If you’re not yet a visual thinker, this should provide you with the necessary encouragement to start. Higher Order Thinking Skills by R. Bruck Williams (http://www.corwinpress.com/booksProdDesc.nav?contribId=535135&prodId=Book230776)… this book looks like it’s written for K-12 teachers (and it even says it is) and may kids all over benefit from it — but it’s even better for us adult folks who maybe know a little about a concept map or fishbone but are just as limited in our visual representations of both ideas and thought processes as presumably kids are. 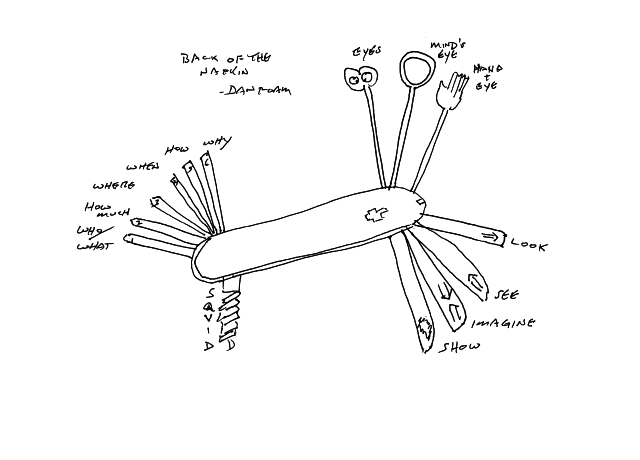 It struck me that Roam’s napkins might be that much more telling about what we’re digesting with a backpack of utensils in addition to the army knife.